By virtue of having no moving parts our acousto-optic modulators (AOMs) are able to amplitude modulate a laser beam at very high speed. For example modulation bandwidths in excess of 50MHz are readily achievable. In an AOM a laser beam is caused to interact with a high frequency ultrasonic sound wave inside an optically polished block of crystal or glass (the interaction medium). By carefully orientating the laser with respect to the sound waves the beam can be made to reflect off the acoustic wavefronts (Bragg diffraction). Therefore, when the sound field is present the beam is deflected and when it is absent the beam passes through undeviated. By switching the sound field on and off very rapidly the deflected beam appears and disappears in response (digital modulation). By varying the amplitude of the acoustic waves the intensity of the deflected beam can similarly be modulated (analogue modulation). It is usual to choose the deflected beam as the one that is used in the optical system because it can be switched on and off with high extinction ratio (typically >40dB) and intensity can be varied from zero to more that 85% of the incident beam. The rate at which the beam can be modulated is governed by the time it takes the acoustic wavefronts to traverse the laser beam, which depends on the beam diameter and the acoustic velocity in the interaction medium. The sound waves are generated by a transducer, usually a thin wafer of lithium niobate, that is bonded onto the interaction medium using a highly efficient cold-weld metallic bonding process. When a high frequency electrical signal is applied to the transducer it vibrates, generating the acoustic wave. The signal is derived from an RF driver, which generates a high frequency carrier that is itself modulated by an analogue or digital input signal. Principal applications for AO modulators are pre-press (putting image and text data onto films or plates as part of the printing process), laser imaging and displays, switching in telecom fibres, instrumentation and research. Interaction Materials: Tellurium Dioxide, Lead Molybdate, Fused Silica, Crystal Quartz, Chalcogenide Glass, Flint Glass. 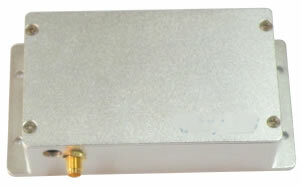 An RF Driver provides the electronic signal operating the AO Modulator. With a digital driver, an external TTL signal enables rapid on and off switching of the optical beam. 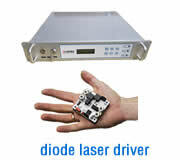 Alternatively an anologue driver enables a variable intensity output, typically from 0% to 85% of the input beam. 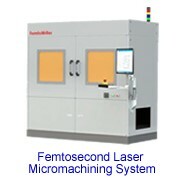 The maximum modulation bandwidth, or optical rise-time, is a function of the acoustic transit time across the optical beam. 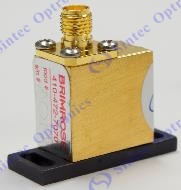 Therefore, for the highest speeds it is often necessary to focus the optical beam down to a small spot inside the modulator. For old AOM product please refer Here! The STBR series free space Acousto-Optic Modulator (AOM) with RF driver is used to vary and control laser beam intensity. It is electronically programmable using a microprocessor connected to the Brimrose RF driver unit. The RF driver features all the necessary components to drive the modulator with analog or digital input control. Our free space AO products are housed in environmentally stable packages. They offer superior resistance to humidity and temperature, and are suitable for laboratory as well as various OEM applications and instrumentations. Our standard fibre-coupled AOMs are listed below. If you would like to see a detailed technical data sheet just click on the relevant model number. 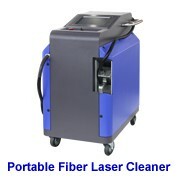 If you do not see a device that meets your requirements please contact one of our engineers. 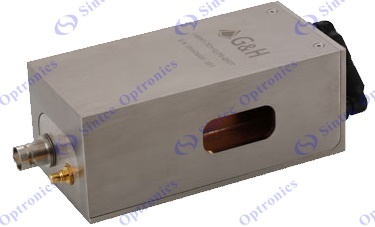 We manufacture application-specific AOMs and would be pleased to design one that meets your needs. The devices listed are aimed at fibre-optic telecommunications applications but we can also offer fibre-coupled versions of our standard AOMs, if required. If you are considering a non-standard device, or are just not sure which of the listed devices would suit you best, you may find it useful to email us with your questions. For old FCAOM product please refer Here! 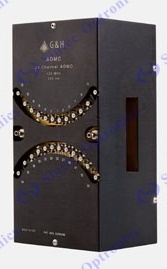 Acousto-optic multi-channel modulators (AOMC) allow multiple beams to be modulated or deflected independently by integrating an array of transducers with a single acousto-optic crystal. Our proprietary optical and electrical designs minimize crosstalk, allowing concurrent operation of up to 48 channels for modulation, and up to 8 channels for beam deflection. 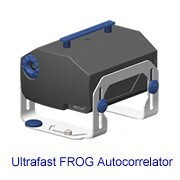 Our AOMCs are known for their reliable operation and high performance. Multi-channel modulators have parallel beams as input, each beam independently controlled by a different transducer to modulate its intensity. Multi-channel modulators are most often used for high speed applications like micromachining and direct-write lithography, as each beam can be modulated independently. These devices can also be used to increase throughput when writing large media by writing multiple beams at the same time. Our multi-channel modulators equal the performance available with our single channel modulators, and can be customized for large aperture applications as well as high speed, small aperture applications. A multi-channel beam deflector however, generates multiple diffracted beams from a single input beam at specific locations by simultaneously applying multiple frequencies to a single transducer. Each individual channel is a deflector that can either scan the beam or produce multiple spots. This makes it possible to create a two dimensional grid. For example, if a four channel beam deflector were configured so that each channel diffracted three spots, the result would be a 4x3 grid. 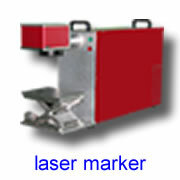 High laser damage threshold is achieved using low-scatter materials. These are inspected to rigorous quality standards. We grow our own tellurium dioxide and source high quality fused silica and crystalline quartz to ensure low insertion loss and excellent optical power handling. *The Driver Must Be Attached to an Adequate Heatsink.